A biography of Miguel Antonio Catalán Sañudo (Zaragoza, 1894-Madrid, 1957), an important Spanish physicist penned by one of his students, based on numerous testimonies from lecturers, former students and contemporary followers. Barceló sees Miguel Catalán as the greatest exponent, in the field of science, of the Spanish liberal culture represented by the Institución Libre de Enseñanza (Free Teaching Institution), a Spanish 19th-20th century educational project. 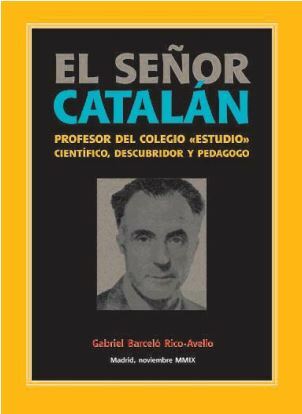 In addition to relating, not without a certain melancholic nostalgia, his spell at the “Estudio” college and his important influence on Spanish science, the author paints us a clear picture of the true character of his admired teacher, so that those of us not afforded the opportunity of knowing him when alive, can appreciate the important cultural impact that both Miguel Catalán, as well as Jimena Menéndez-Pidal, had at the time. The author recalls in the book an unforgettable lecture on rotating bodies in which his teacher attempted to convey his own dynamic hypotheses to his class, provoking such interest that fifty years later they gave rise to the Theory of Dynamic Interactions proposed by the author.